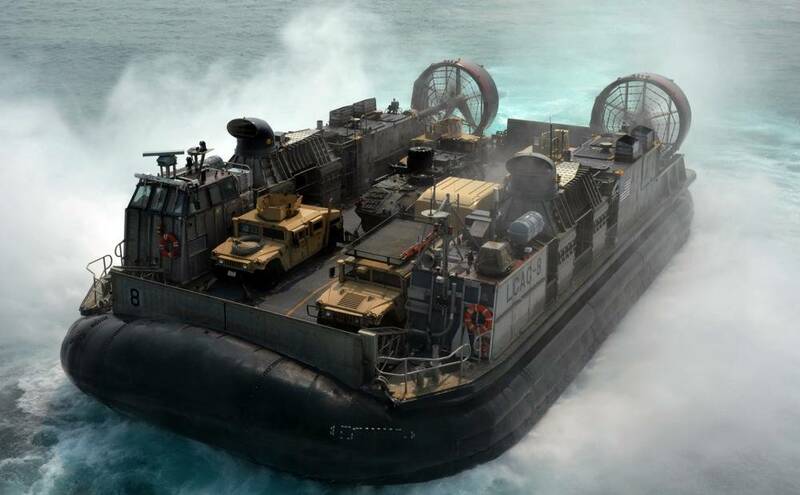 Landing Craft Air Cushion (LCAC) modernization programs keeps them operational until replaced by the new 'Ship to Shore Connectors'. Originally designed to be in service for 20 years, the program will extend the class’s operational life to 30 years. The fully amphibious LCACs are capable of carrying a 60 to 75 tons of equipment, including M-1 tanks , while travel at speeds of more than 40 knots. Because they ride on a cushion of air — no part of an LCACs hull penetrates the surface of the water — the vessels are less susceptible to mines than other assault craft or vehicles. The LCAC Service Life Extension Program, which began in 2000, is actively improving these versatile platforms. In conjunction with repairs and craft mods to extend the service life, the program includes upgrading the power train to decrease fuel consumption and maintenance while providing additional power to the craft. The Navy also is replacing older technologies, including the command, control, communications, computer and navigation systems. Of the 91 LCACs originally built, the Navy intends to put 72 operational craft and one test craft through the Service Life Extension Program. As of February 2013, 43 craft have received upgrades, eight additional crafts are currently undergoing upgrades and an additional 22 crafts are planned for upgrades through Fiscal Year 2018. The LCACs will continue to support a wide range of amphibious operations until the replacement Ship to Shore Connectors reach initial operational capability in 2020.